Indonesia Extends Exclusion Zone Around Volcano That Caused Tsunami Anak Krakatau, whose partial collapse is blamed for triggering Saturday's tsunami that killed at least 430 people, remains active — spewing ash over a large area around the Sunda Strait. Anak (Child) Krakatau volcano erupts, as seen from a ship on the Sunda Straits, Indonesia, on Thursday. The news agency quoted the country's civil aviation authority as saying no airports would be affected. On Saturday, a section of the volcano's crater collapsed into the ocean, triggering tsunami waves of more than 6 1/2 feet that crashed into coastlines along the Sunda Strait, killing at least 430 people. It was the second tsunami to hit Indonesia in the past three months. Saturday's wave "swept over popular beaches on southern Sumatra and the western edge of Java, inundating tourist hotels and coastal towns, including Sumber Jaya, leaving a trail of death and destruction in its wake," according to Channel News Asia. As The Associated Press notes, "The disaster struck without warning, taking people by surprise in a country that regularly suffers landslides, earthquakes and volcanic eruptions. No earthquake shook the ground beforehand, and the waves surged inland at night on a holiday weekend while people were enjoying concerts and other beach and resort activities." Since then, photos taken by Indonesia's National Agency for Disaster Management, or BNPB, show a layer of volcanic ash has settled on buildings and vehicles along the west coast of Java. The Indonesian government has warned of further tsunami, cautioning nearby communities to stay at least 1 kilometer away from the coastline. "Since December 23, activity has not stopped ... We anticipate a further escalation," said Antonius Ratdomopurbo, secretary of the geological agency, according to Reuters. Heavy rains and high seas have hampered search efforts — some of the dead have been found at sea. At least 159 are still missing, the AP reports. Nearly 20,000 people have been displaced by the tsunami and nearly 1,500 injured, according to Reuters. As Reuters notes, "In 1883, [Krakatau] ... erupted in one of the biggest blasts in recorded history, killing more than 36,000 people in a series of tsunami and lowering the global surface temperature by one degree Celsius with its ash. 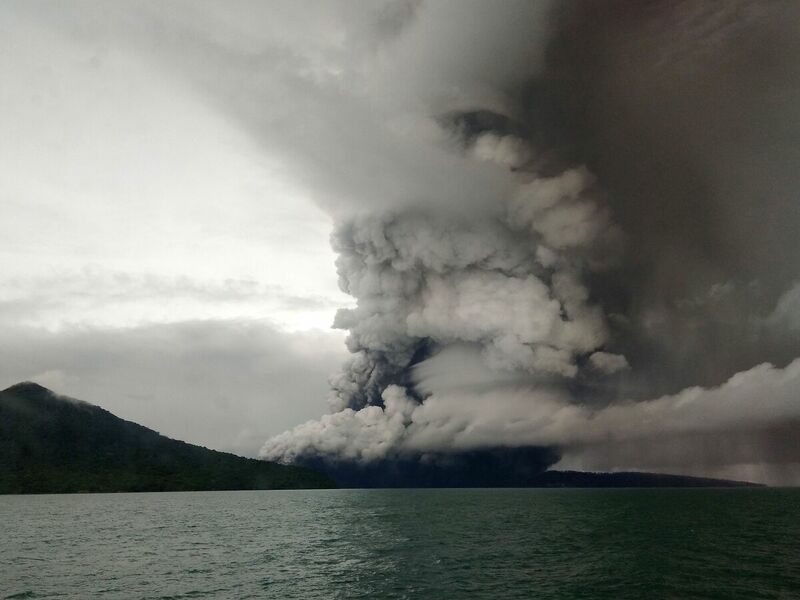 Anak Krakatau is the island that emerged from the area in 1927 and has been growing ever since."